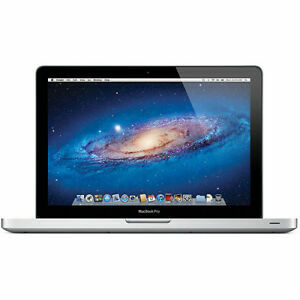 Lightweight, sleek, and built to impress is the Apple MacBook Pro A1278 13.3-inch laptop. This laptop offers a high-end feel within a small package. It has a 13.3-inch screen and weighs in at 4.5 pounds. The Apple MacBook Pro features a 720 pixel FaceTime high-definition camera, is Wi-Fi compatible, and has RAM storage space of 4 GB. It also boasts a hard drive capacity of 500 GB and has a convenient backlit screen and keyboard. This device is the ideal choice for someone who works or plays while mobile and looking for quality in a laptop. Battery Run Time Up to 7hr. The MacBook Pro was a great purchase for this model. This computer exceed my expectations and works really well.The store near my house that sales used Mac Computers couldn’t come close to the price I paid for this MacBook Pro. The only thing that was weird and I should have noticed it before buying the product was the keys on the keyboard. They are not in American standard style. Luckily for me, I don’t have to look at the keys to type. If you need to look at the keyboard when you type, look at the pictures carefully. I have an Austrian key board on My MBP, meaning it does not look like a typical American keyboard, it’s close but not the same. I think of it as my theft deterrent. With that said, I would buy another computer without hesitation. THIS IS ONE OF THE BEST MACBOOK PROS EVER! FOR THE SAKE OF PORTABILITY I SWITCHED FROM A 15" MBP TO THIS 13". SCREEN SIZE DIFFERENCE IS MINIMAL. THE 2012 EDITION IS A VERY GOOD IMPROVEMENT OVER THE 2011 MODEL, AND SPEED (WITH SUPER WIFI CONNECTION) IS QUITE AMAZING. THE SSD 1TB DRIVE ADDED TO THIS COMPUTER PRODUCES NO SOUND, AND THE 8 GIGS OF RAM IS QUITE SUFFICIENT, UNLESS YOU ARE A GAMER. I NOT LIKE THE SLIM-TRIM EDITIONS PRODUCED AFTER 2016 WHEN APPLE DECIDED TO REMOVE THE SUPER DISK DRIVE- IT MAY HAVE SAVED A LITTLE WEIGHT OFF THE COMPUTER BUT DID NOT IMPROVE THE QUALITY OF THE PRODUCT. I THINK APPLE MIGHT BENEFIT FROM SELLING IMPROVED TECHNOLOGY AND LEAVING SOME OLDER FEATURES, LIKE THE DISK DRIVE, FOR US OLDER FOLKS WHO LIKE TO BUY CDS/DVDS AND LOAD THEM UP FOR FUTURE USE. THIS IS A GREAT COMPUTER, COMBINING NEW AND SLIGHTLY OLDER FEATURES THAT MAKE IT ONE OF THE BEST COMPUTERS AROUND. My MacBook Pro 2012 13” came packaged improperly and with a very used charger. The computer is still a score though and had no damage other than cosmetic stuff. It came very speced out and had a i7, 8gb of ram, and a 750gb hard drive! The gpu showed up in 10.8.x as having about 512mb of vram but once I upgraded to High Sierra it showed up as having 1.5gb of vram which is the correct amount of vram. It’s missing a couple of screws on the bottom but that’s no big deal. This computer is a must have for those that want a powerful laptop in a reasonably heavy package. Just don’t try installing windows 10 on it. The drivers are not available. Bought this for my wife. It was a brand new unit even though it is a 2012 model. She likes her mac very much. I increased the memory to 16 mg when it first arrived. It's fast and trouble free. It has all the features and all the needed applications come standard. She is transitioning from Windows and it's been a learning experience but she says "never going back". Great speed, superb quality, excellent functionality, but expensive. An excellent laptop. I love the functionality of the Mac operating system and find it superior to Windows. This Macbook Pro is fast with its i5 processor and USB 3.0 and Thunderbolt ports. I still have several video cameras that use tape, so the Firewire port is a must. The only reason I docked it one star was the cost of a Macbook. They are built with great quality, but the pricetag is more than twice that of an equivalent functioning PC laptop.